Vazante – Daniela Thomas new feature film. New York Premiere hosted by IBOC. Featuring a Q&A with the director following the 7pm show on 1/12! About: Forced to marry a slave trader and live on his decaying farmhouse in the Brazilian mountains, young Beatriz faces physical and emotional unrest beyond her years in this lyrical and nuanced historical mood piece from director Daniela Thomas. IBOC associate composer Angelica Faria along with her Intercultural Art and Healing Project will be presenting Tribute Concerts to honor the eighteenth-century Brazilian Composer Jose Mauricio Nunes. 25 Carmine St. West Village, NY. The International Brazilia Opera Company presents a repertoire of spiritual music. Plastic Flowers – for the first time staged in NYC! There will be an artist talk following the show. End of the year recital for IBOC. Featuring pianist YinJia Lin and the voices of two of our star singers: Flavia Correia and Kristin Young plus singers from the Brazilian Chorus of New York. The Brazilian youth orchestra has been invited to participate in the 70th-anniversary celebration of UNICEF, at the United Nations Headquarters, on December 12th, 2016. It is a remarkable accomplishment for the young musicians from Recife, Brazil, and they are very honored by this invitation. In 2006, the orchestra was created in a neighborhood that has been reported with one of the lowest human development indexes. Ten years later, 330 children have become well-trained musicians with a path to the future. During their stay in the city, the Orquestra Criança Cidadã will be giving a concert to thank the people of New York and the generosity of all the members of the Brazilian community for their much-appreciated support. The concert is open to the public, and admission is free. United Nations – Orquestra Criança Cidadã at the Câmara do Conselho Econômico e Social das Nações Unidas, New York. Scandinavia House New York – November 10th and 12th, 2016. SNAFU 28 at 37 E. 28th St. – NYC – 10pm – $20 – First Drink Free! Saturday, April 16th – Upper West Side! – Stay tuned! Close to the B, C, and 1 trains. 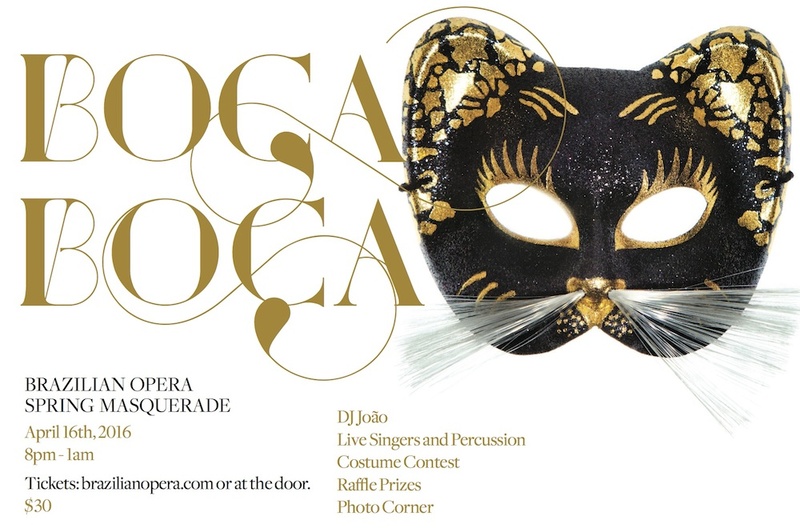 All proceeds support the International Brazilian Opera Company. For concert reservations, call 212.847.9740 or email event_reservation@amscan.org. João MacDowell makes his Scandinavia House concert debut with his third opera Cries and Whispers. Inspired by Ingmar Bergman’s 1972 film of the same name and the Greek myth of Hekate, the story centers on three sisters – Laura, Dina, and Betty – as they prepare for the imminent death of the youngest. The roles of Laura, Dina, and Betty will be performed by the sopranos Kristin Young, Alexandra Filipe, and Brooke Larimer. Conducted by Néviton Barros. Brazilian composer João MacDowell has a career that spans from electronic music to bossa nova to opera. Tamanduá, his first opera (2008), received the Boston Metropolitan Opera’s Merit Award in 2014. MacDowell’s second opera, Plastic Flowers, premiered in New York City in 2012, and was fully staged in Rio de Janeiro (2014-15).The National Theater Orchestra in Brasilia, Brazil (OSTNCS) premiered João MacDowell’s Symphony No.1 in 2014, conducted by Claudio Cohen. After he participated in an artistic residency at The Bergman Estate on Fårö in 2014, where he worked on Cries and Whispers, the International Brazilian Opera Company premiered an excerpt from the opera in March 2014. Audience entrance: E. 25th St. between Lexington & 3rd Aves. Tamanduá at Alexander Kasser Theater, Peak Performances, MSU. Entirely performed by American singers with no previous knowledge of Portuguese. Presenting a new way of perceiving the possibilities of the genre.